Swansea City have a special place for EPL fans. First off they are as close to a hipster club as they come in the EPL (which isn’t saying much considering how large the EPL is; no EPL club can really be a true hipster club), their rags to riches story rivals the likes of Southampton and Bournemouth (they were sold back in 2001 for £1 pound! ), and they’ve gained the reputation for at times playing slick possession football. Swansea also have a special place in the heart of EPL fans because they are a wonderful case study for analytics on when does overperformance become less luck based and more something that the data currently constructed publicly is missing what a club could be potentially doing. 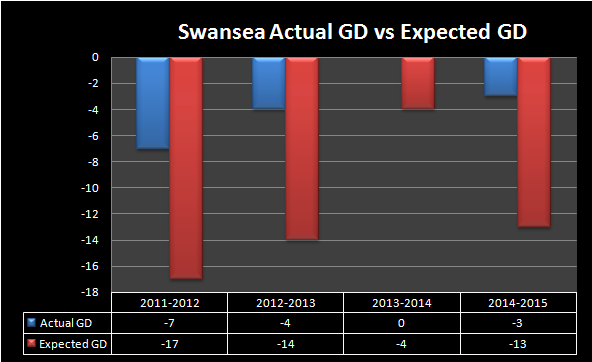 Since Swansea City have been promoted to the Premier League, they have consistently overperformed a great deal relative to expected goal data. Thank you to Paul Riley (@footballfactman) for making his ExG data public over the last five EPL seasons. Three of the four seasons Swansea have been a Premier League club, they have outdone ExG GD by at least 10 goals! Swansea have been in the bottom six in ExG GD and yet they have finished around mid-table in all four seasons of their EPL existence. Last season, Swansea were just 4 points out of 7th place, which would’ve came with qualifying for the Europa League playoff rounds. That’s it. Only the two Manchester teams have been able to outdo ExG GD to the extent that Swansea City have, with an added caveat that ExG data has a tendency to somewhat underrate what the highest echelon of clubs produce. So Swansea are really in a rarified air when it comes to what they’ve been able to do. There are other non EPL examples of clubs who have done similar things, with Borussia Monchengladbach being an example of a club who have outperformed data to the point where it’s just a possible blind spot in what we currently have publicly. Now there is good news to all of this: Swansea might actually be good this year. No, not good where they finish 6th-8th but have bad underlying data once again and we renege this same debate next summer, but a genuinely good team where both the place in the standings and their underlying data blend well together. It’s certainly the most talented team Swansea has ever had. Sure, Wilfried Bony isn’t around anymore but Bafetimbi Gomis probably ranks as a slightly above average striker in the Premier League and can do a decent amount of things that Bony did. Swansea were part of the EPL’s raiding of Ligue 1 talent when they signed Andre Ayew from Marseille and Frank Tabanou from Saint Etienne, two shrewd signings that give depth and starting XI talent in the case of Andre Ayew. Jefferson Montero and Ayew give a one-two punch on the wings that ranks among the better wing combos in the Premier League. Gylfi Sigurdsson is an underrated #10 while Ki Seung-Yeung and Jonjo Shelvey is the best midfield pivot combination that no one talks about (they’re certainly better than Henderson – Milner). And killed Newcastle after Newcastle looked like a competent team for the first time since… last January versus Southampton. Jonjo Shelvey has been the most interesting character on Swansea. Shelvey is someone who was always laced with talent, but he never could quite put the entire package together. He’s a one man show, for both good and bad. He’s got one of the better long range shots in the EPL but he may be a little more than happy to fire them away at a rate that probably veers towards irrational confidence. It was his throughball to Gomis versus Chelsea that led to Thibaut Courtois’ red card and Gomis’ subsequent penalty conversion which earned Swansea a deserved draw versus Chelsea. He picked apart Newcastle and spoon-fed another delicious throughball to Gomis for the first goal versus Newcastle. We’ve seen Jonjo have flashes like this before, but maybe, just maybe he can play at this level for longer durations this season. Certainly if this happens, Gomis will reap the rewards of a peak season from Shelvey. Swansea have all the tools to be the fifth best team in the EPL this season. Their squad is the most loaded it’s ever been. Gary Monk might be an actual good coach, which is somewhat a rarity in the EPL currently. If Lukasz Fabianski could replicate 80% of what he did last season (upper echelon goalkeeping) then Swansea will probably have a very good season. The attack has the perfect blend of directness, creativity along the flanks and goal scoring capabilities. Defensively, Swansea should hold up okay, especially compared to the likes of Tottenham and what we’ve seen from Southampton so far. Swansea City have definitely had their ups and downs over the past 10-15 years of their existence but now they’re flying high and possibly higher than they’ve ever flown before. It is after all, The Swansea Way. This entry was posted in Analytics, English Premier League, Features. Bookmark the permalink. Which Euro 2016 qualifier are you most looking forward to watching?